I'm working on a bunch of raster imagery using ArcGIS 10.6. And here's my full model. The problem is, I can't connect the other value (ssh, sal, etc) into cell statistics. Is it bug of cell statistics? 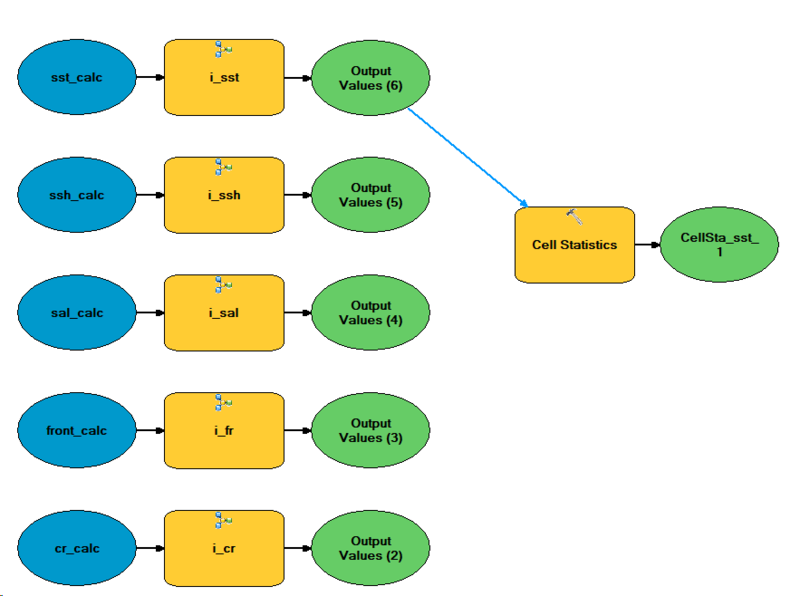 I believe this to be the expected behaviour, the Cell statistics tool takes a single list, so this is why you can't connect the multiple outputs. Turns out there is an easy solution, you feed the outputs of your sub-models into a collects values tool in the master model. This provides a single list to the cell statistics tool. Not the answer you're looking for? Browse other questions tagged arcgis-desktop arcmap modelbuilder spatial-analyst or ask your own question.